Buckskin is the only horse with a nodding up and down jointed head! Body: Darker golden Palomino color, white mane, tail, socks. Boxes (2): Blue square western box, 'Best of the West' color box. Buckskin is the only horse with a nodding up and down jointed head! 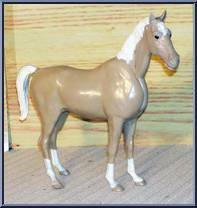 Body: Rare beige taupe Palomino color, with white mane, tail, socks. Box: Square green western box. Body: Darker carmel with 1st generation body Accessories: Soft medium brown, hard dark brown. Box: 'Moveable Indian' in bilingual and english, 'Best of the West' box. Body: Light lime green 2nd generation. Accessories: Soft teal blue (even though pic shows different accessories), hard silver. Box: Unknown. Comanche, the only leg jointed horse. 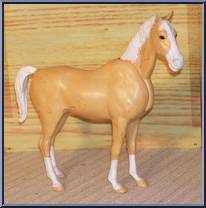 Body: Canada exclusive is in a rich darker golden Palomino color, with white mane and tail. Box: Comes in boxes Fort Apache Fighters, Best of the West. Comanche, the only leg jointed horse. 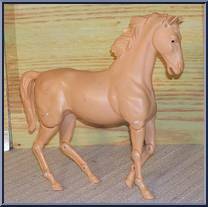 Body: Rare production version, regular palomino color, but only the eyes are painted. Box: Striped 'Fort Apache Fighters'. 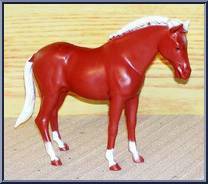 Flame is a running molded stiff horse for Jane. 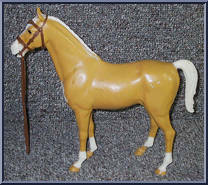 Body: Rich darker gold palomino color, with white mane and tail, black hooves. Box: Rectangle photo box with sky and desert 'western horse'. Body: Steel Blue. Accessories: Yellow scarf & gloves, soft & hard black. Box: 'Fort Apache Fighters'. Body: Light green, rivets in shoulders. Accessories: Soft teal, hard silver. Box: 'Fort Apache Fighters' with new 'MOD' splash. Body: Black Body, dark hair. Accessories: Coral color accessories. Box: 'Johnny West Series' with 'mod' black stamp, and then one with blue square bilingual, then a plain mailer that was a variety of . . . Body: Darker carmel than U.S. version. 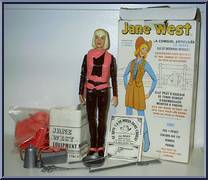 Accessories: Darker brown than U.S. version Box: 'Johnny West Series' French bilingual box, then a plain mailer that was a variety of all issues. Body: Dark maroon. Accessories: Bright pink and hard silver in the 'mod colors' box, Light pink and hard silver in regular vargas box. Boxes: Vargas (1st Moveable Cowgirl box) with 'New Mod Colors' sp. . . 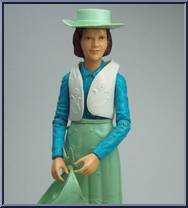 It's unknown if this was a produced figure, or test type, or another country's. It is claimed to be Canada's. Body: Red body & dark hair. Accessories: Supposedly soft cream & hard dark brown. . . . Body: Turquoise. Accessories: Soft cream, but sometimes with Taupe or Dark Brown sets in vargas English box, Light pink and silver hard, or Cream with dark brown hard in the bilingual Vargas box, late. . . Body: Dark royal blue body. Accessories: Soft pastel green or soft cream accessories. Box: 'Johnny West Series' bilingual and English, sometimes 'mod color' stamp, and mailer that varied editions. Body: Turquoise blue. Accessories: Soft cream or pastel green accessories. Box: 'Johnny West Series' bilingual and English, and mailer that varied editions. Body: Black body. Accessories: Soft white or taupe accessories. Box: 'Johnny West Series' with mod colors stamp, then plain mailer that varied releases. Body: Darker carmel than U.S. version. Accessories: Darker brown than U.S. version. Box: 'Johnny West Series' French bilingual box, then a plain mailer that was a variety of all issues. Body: Bright green. Accessories: Soft bronze (see-through, olive green, or dark bronze), hard silver for the mod box, Soft bronze or brown and hard dark brown or silver for bilingual striped box. Box:. . . Body: Darker carmel than U.S. 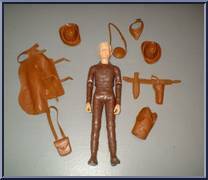 Accessories: Soft medium brown, hard dark brown. 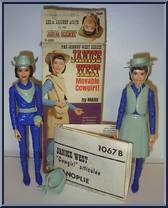 Box: 'Moveable Cowboy' with bilingual flaps, campfire box bilingual, plain mailer that varied editions. Body: Dark blue. Accessories: White or off-white. Box: 'Johnny West Series' with 'Mod' stamp, plain mailer that varied editions. Pancho is a smaller sized stiff molded pony for the children. 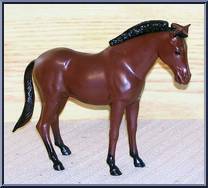 Body: Dark brown bay, with black mane, tail, hooves. Box: Striped western that shows sorrel Pancho on illustrated desert. Pancho is a smaller sized stiff molded pony for the children. Body: Sorrel, the same as U.S., however with white mane, tail, and socks (instead of beige). Box: Striped western that shows sorrel Pancho. . . Body: Cream, black hair (same as U.S.) Accessories: Either standard U.S. assortment of coral and blue alternating, or a Canada exclusive marbled (swirled) coral and blue alternating. Box: 'Best of the. . . 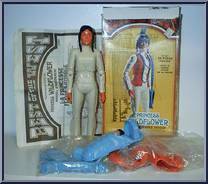 Same as U.S. version, except no hole in left hand for the stiletto. Body: Black. Accessories: All black. Box: 'Best of the West' with bilingual bits. Body: Carmel brown body, black hair. Accessories: Regular US soft black & silver hard cowboy accessories. 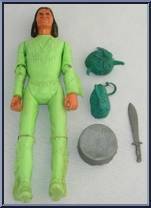 Box: Brown mailer that said 'Sinister Sam Cobra'. 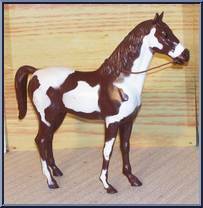 Body: Pinto in Bay (brown) colors and white patches, however the main, tail are brown as well (unpainted). Accessories: Indian blanket & rope tack. 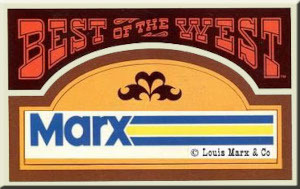 Box: 'Best of the West' color. 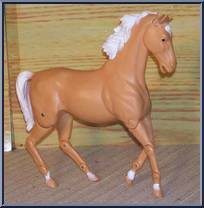 Body: Pinto in Bay (brown) colors and white patches, however the main, tail are brown as well (unpainted). Accessories: Comes with assembly corral fence. Box: Cardboard with red and brown ink. 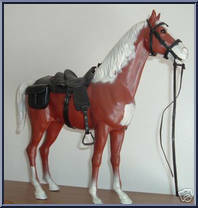 A larger size stiff molded standing horse, the most common horse used for Johnny, and others. 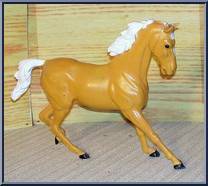 Body: Darker golden Palomino color, with white tail, mane, socks, light hooves. 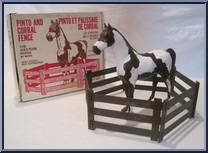 Boxes (3): Plain mailer, s. . .
A larger size stiff molded standing horse, the most common horse used for Johnny, and others. Body: Same Palomino color as U.S., however the main, tail, socks are white (instead of cream). Boxes (3): . 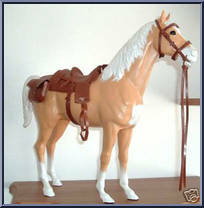 . .
A larger size stiff molded standing horse, the most common horse used for Johnny, and others. Body: Sorrel (rusty red) color with white main, tail, socks. Box: Unknown. 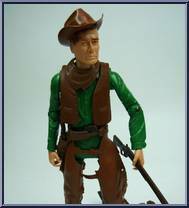 A small colt of Thunderbolt, stiff molded stance. 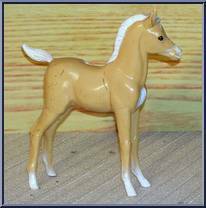 Body: Darker gold palomino color, with white main, tail, socks. Box: Square photo with blue sky & grass 'western colt'.